Gum disease is simply an infection of the gums or gingiva, better known as gingivitis. Even if you don’t have symptoms for gum disease, you may have already experienced the beginning stages of gingivitis. For most people, this can be a silent and painless infection that builds up over time and eventually worsens as you develop plaque buildup. It’s not until the gums are severely infected and showing signs of swollen gums, redness and bleeding, gum recession, or loosening of teeth that they seek professional help. When gum disease is left untreated, it can rapidly progress into a more serious condition called periodontitis. This is caused when the gingiva becomes inflamed and pulls away from the teeth. 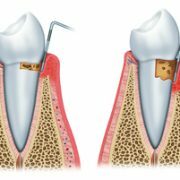 Bacteria can easily set into the pockets that are formed from this inflammation down to the root of the teeth. This can cause a breakdown of tissues and lead to permanent bone damage and tooth loss. Some causes of gum disease are simply caused by poor dental hygiene. Forgetting to brush and floss regularly are usually the first things that are left unchecked with infections that occur in the mouth. Other risk factors come from smoking, poor nutrition and eating habits, Vitamin C deficiency, medications, and stress. Brush your teeth for two minutes at least twice a day is the minimum requirement recommended by the American Dental Association. Plaque and bacteria can also invade your tongue, so give it a good brushing also. Electric toothbrushes can do a better job at getting the plaque and tartar off your teeth, so a small investment in a quality toothbrush can save you thousands in the future. Choose an ultra-soft toothbrush that can help stimulate the gums without harming them. Aggressive brushing can lead to recession and trauma to your gums. Flossing is an essential part of keeping gum tissue healthy. The C shape method is widely recommended by dentists to get into every space between your teeth. Has your dentist provided you with a flossing technique specific to your needs? Ask Dr. Sorensen what he recommends for you. Using a mouthwash that contains fluoride is better for your gums and tissues than mouthwashes that contain alcohol, which can dry out your mouth and cause xerostomia. Regular dental visits are needed for superior oral health, even to keep an eye on existing dental work. This includes dental x-rays, prophylaxis with scaling done by a dental hygienist, and an exam by Dr. Sorensen to complete your visit. If you do see signs of redness or bleeding gums, it is important to visit with your dentist to find immediate solutions to correct and maintain a healthy smile. A healthy person can fight the increasing bacteria with correct brushing, flossing, making regular visits to their dentist, and by establishing healthy oral habits. https://www.canyondentalcare.com/wp-content/uploads/2015/07/gum_disease.jpg 201 600 Staff Canyon Dental https://www.canyondentalcare.com/wp-content/uploads/2018/05/Canyon-Dental-New-Logo-trans-3-e1526588705132.png Staff Canyon Dental2015-07-01 16:17:472015-07-01 16:17:47Do You Have Gum Disease?